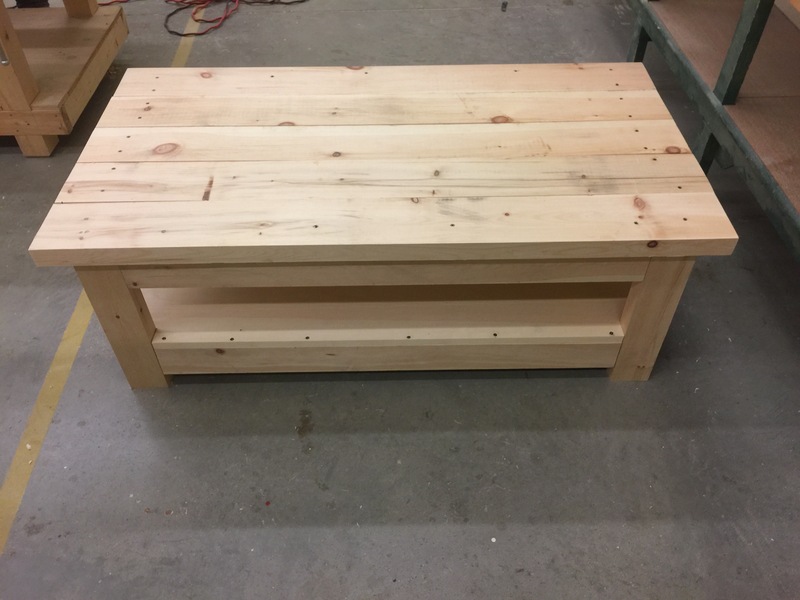 This week’s carpentry class at Canadore College, I was determined to finish up my coffee table. Last class, I had drawn on my cut-out pieces, so this week I needed to start by actually cutting them out. 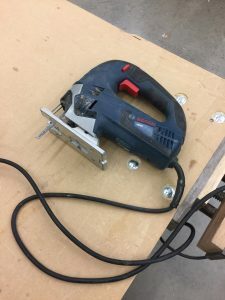 I had never used a jig saw before, so I set up a practice piece, and did a few tries to determine the thickness of the blade, required pressure on the trigger, and just to get a feel for the power tool. After I was satisfied with my practice cuts, it was time for the real deal. I grabbed my two 48” boards, which were pre-marked for cutting. I used quick clamps to secure the board to the worktable. Using the jig saw, I cut on the inside of my line (to account for the thickness of the saw blade). After flipping the board and repeating the process (and then again for the other board), I was set to insert them. The first board went in like a dream! The second one needed a bit shaved off the edge. I clamped it down and made the adjustment quickly. Both boards were in! I inserted the middle board to ensure a good fit, then I used 2” screws to secure it down. It was a bit tricky because of the upper rail- I had to go in at a slight angle, but I managed to get it screwed down. Next, I placed my top boards. Since they are a bit longer and wider than the frame of the table, I decided to go with an overhang. 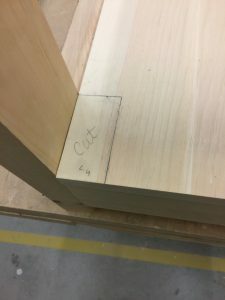 I measured the frame against the length and width of the tabletop. From there, I centered the boards so the overhang was equal on all sides. 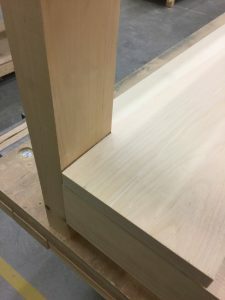 Once the pieces were placed, I used quick clamps to secure them down. Using 3” screws, I secured all the boards. As a last step, I used a sanding block to get rid of any rough edges on the table. And that’s it! My table is complete! I’m happy with how it turned out! I’m impressed with myself that I was able to complete this table. It’s sturdy and well-made. 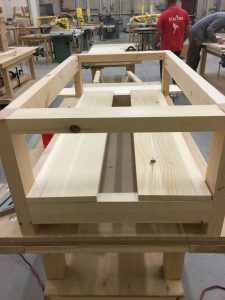 I used many power tools that, before I attended this class, I’d never even dreamed of using. I think, in terms of skill, I’m definitely improving. That doesn’t mean I don’t have a long way to go, but it’s neat to be able to look back and see what I could do then and what I can do now. Since graduating from Lakehead University in 2011, Samantha gravitated towards the construction industry. With a quick wit and a knack for terrible jokes, her time management skills enable her to find the time to contribute to Hard Hat Hunter’s growing community.